I’ve used the beloved ORB again! I have this space, kinda like a window I guess, in between the dining room (the ugly gold & purple walls that you see) and the entry way. Isn’t my little Kinsey just such a cutie-patootie? Anyway, I gathered up several candlesticks I had around the house to display in this open space. I’ve got cream candles to go on top but for the holidays I bought some silver ones at IKEA. 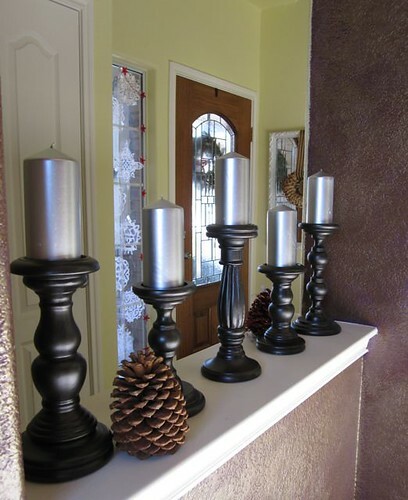 They totally clash though – especially with the silver candles on top. 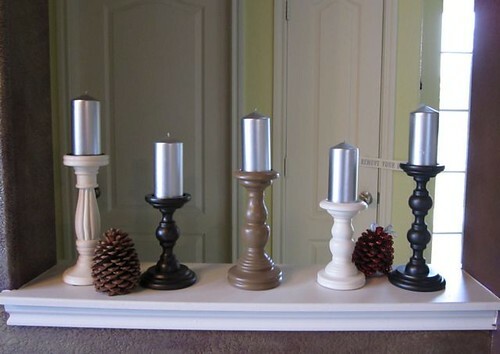 So I went back to my roots, my bread-and-butter, and painted all the candlesticks with my beloved Oil Rubbed Bronze spray paint from Rustolium aka ORB. This new house of mine is slowly starting to come together. 🙂 Now I just need to paint those ugly gold and purple walls! 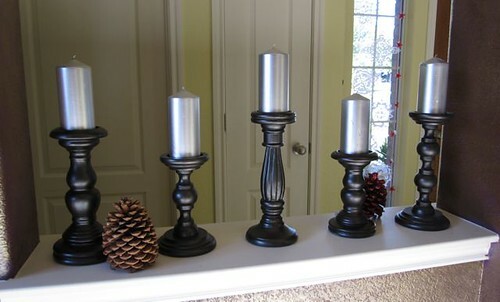 After Christmas I’ll take down the silver candles and replace them with the cream ones I already have. 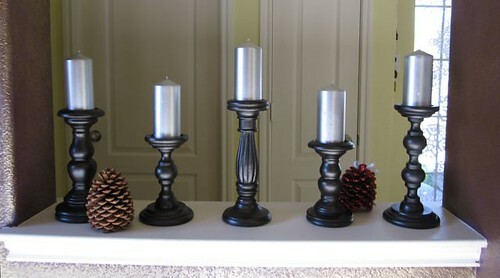 That way the candlesticks can stay up year round. ORB rocks. Again. As always. I JUST discovered ORB this year and love it. Your candlesticks look great in that nook. Love them all painted the same color! I am so going to paint my ugly bronze light fixtures with that stuff. Gotta love ORB! The candlesticks look great! oh yes, I like this very much! I love ORB! ORB to the rescue again! Looks fabulous! it can transform simple to sensational (thanks to you). really been busy this year. 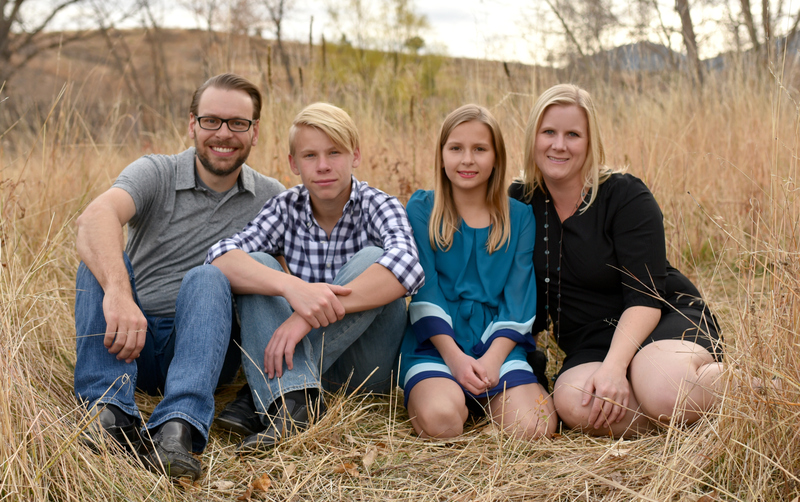 Just imagine – the previous owners of your house are reading your blog. 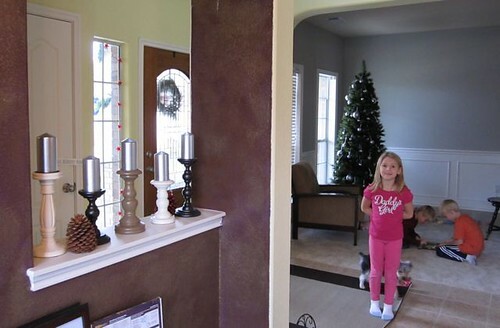 They spent HOURS faux-finishing that beautiful dining room. They are reading your constant jabs at how horrible it looks. They are crying and insulted and wishing that the bank didn’t throw them out (it was a foreclosure, right?). If there was one.thing that they could have taken from that house it would have been that dining room, but unfortunately it couldn’t go with. Now, put yourself in their shoes. How do you feel? Wow, those look so great! OMGoodness; yes, yes, yes – ORB! Now why didn’t I think of that?? I have some pricey condlesticks that I’ve just never really loved – the bases are distressed terra cotta – fine for a “Southwest” motif, but just don’t quite work with my “PB meets Ballard” look in my living room. Can’t wait to get started. You continue to inspire with your creative reinventions. Thanks so much. Happy New Year! Those are super cute! Great idea! !